Welcome to Chocolate Candy Mall's monthly chocolate candy newsletter, Charmingly Chocolate. Here are some cheap Fathers Day gifts to make and some that are not as cheap but very much appreciated. Make one of these homemade Fathers Day ideas your own this year and spoil dear old dad! Father's Day this year is Sunday, June 21, 2009. Have you decided what to do for your father, grandfather, husband, son, or friend? Everyone seems to be tightening their belts these days, so a list of cheap fathers day gifts to make yourself seems to be in order. You don't have to make a gift, of course, but it IS fun and usually a lot less expensive than purchasing a gift for Father’s Day. How about these Cheap Father’s Day Gifts to Make? Make Dad his favorite candy!- The ingredients for fudge, truffles, chocolate covered peanuts, or whatever sweet your dad can’t resist is only going to cost you a couple of dollars and a little bit of time. Use one of our easy homemade chocolate candy recipes and put a smile on your father’s lips! Make a homemade Gift Basket! - It doesn’t have to be a literal basket. Grab a shoe box, a bucket, a large plastic bowl from the dollar store, anything that suits your dad and start filling it with his favorite treats. If your dad has a hobby, you can make it a themed gift basket. Put gardening gear in a bucket, or fishing gear in a small cooler. If your dad’s the type that likes to spend time watching sports, grab a big bowl or box and fill it with chips, nuts, sodas, pretzels, and candy bars so he’s ready for the next big game in front of the TV. Make a homemade video! - Record as many family members as you can, giving their greetings to dad or granddad, sharing a favorite memory or something special that they enjoy about dad. If you know how, burn it onto a DVD so dad can watch it over and over throughout the years. It will be a priceless gift that costs less than a dollar! Make a storage box for Dad’s trunk! - This is a great one for the kids. Get a nice sturdy cardboard box and let the kids decorate the box for dad using markers or even cutting pictures from magazines and pasting them around the outside. Add handles by poking two holes on each end and pushing a piece of rope through to the inside. Knot the ends to make the handles secure. Dad can put this box in the back of his truck, in the trunk (boot), or even in the back seat to store his gear when he’s on the go. Make a coupon book! - There’s nothing quite like an IOU. Create a homemade coupon book promising to do particular chores like washing the car, vacuuming the car, running errands, a back rub, whatever you know your dad would like. He can collect any time in the next year just by handing over a coupon. Make molded chocolate candy! - This is so much fun, and yummy too. Get some chocolate, molds, (and lollipop sticks if you want “pops for pop”) from Candyland Crafts for just a few dollars. By melting the chocolate in the microwave and stirring every 30 seconds, it is so easy to create clever molded chocolate candy in just a matter of minutes. All you have to do is fill the molds and let them set. You can get creative by using colored melts and a clean paint brush to design your chocolates to perfection if you like. Allow your chocolate to set at room temperature, or place it in the fridge for 10 minutes to speed the process up. If you don’t have the time to make a homemade personalized gift, or if you aren’t worried about finding cheap Father’s Day gifts to make, here are some of my favorite top picks. Gourmet Gift Baskets - classy gift baskets he'll love. Boca Java Coffee - for the guy who can't survive without his brew. zChocolat.com - for the man who loves chocolate and can appreciate the good stuff. Candy Warehouse - all his old favorites and plenty of it. 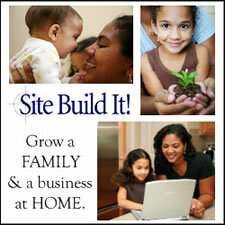 Or even better yet, if you’re dad’s interested in starting some type of business from home, you can really get him started on the right track with SiteBuildIt! He can turn a hobby or interest into a fun, money making venture! Whatever you decide to do for your Dad or another special man in your life, I hope you’ll take the time and make the effort to let him know how much he means to you. It’s a rough world these days for some of our guys and I’m sure your love and gratitude would really mean a lot! Happy Father’s Day to all you Dad’s! I hope you enjoyed this issue of Charmingly Chocolate. If you have any feedback or comments you'd like to share with me, just reply to this zine and let me know.